An aunt sent this beautiful bouquet to the hospital. As I was tidying for visitors today, I noticed that about half its blooms had already withered. I decided to recycle the still-sturdy stems into smaller vases to set around the house. You get the most impact by regrouping similar flowers or colors. Make a fresh cut on each stem to prolong its life, and strip away any soggy leaves which spoil the water faster. 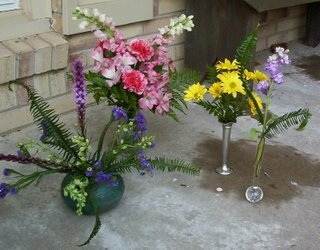 I like to add snips of potted ferns or garden greenery, too. 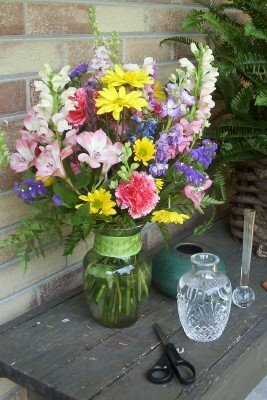 It’s a good way to practice arranging flowers without having the pressure (and cost!) of a fresh bundle. I didn't have much time before the baby woke, but at least I'll get to enjoy the summer colors a few more days. I'm glad you have energy to post! Praying for little ELise and her jaundice. Wouldn't it be wierd if someone reading this blog recognized our home as that of her own grandmother's? Well, if someone DOES recognize your home as formerly her grandmother's, that one couldnt help but be delighted to know it is in loving hands.